Alongside the 5.8-inch OLED iPhone, Kuo continues to believe Apple will also offer standard 4.7-inch and 5.5-inch LCD iPhones, but it is not yet clear what features those devices will adopt. In previous research notes, Kuo has said they will include glass bodies and wireless charging, but he has not gone into detail on other potential features. He does, however, say that the OLED iPhone will be "the only bright spot" in the 2017 iPhone lineup, suggesting only minor improvements for the other two rumored devices. Because the OLED iPhone will eliminate the Home button, it is expected to adopt "other biometric technologies," which other rumors suggest could include things like iris or facial recognition. Battery life may also be another major change in the OLED iPhone, with Apple expected to introduce a stacked logic board design to support bigger batteries and longer battery life. In today's report, Kuo says the iPhone 8, though similar in size to the 4.7-inch iPhone 7, will feature a battery capacity similar to the larger 5.5-inch iPhone 7 Plus. With the radical design changes, battery improvements, and the new biometric features, Kuo expects the OLED iPhone to cost in excess of $1,000, a pricing rumor that was also shared by Fast Company last week. Kuo does not expect the high price point to significantly impact sales due the "innovative user experience" offered by the device. 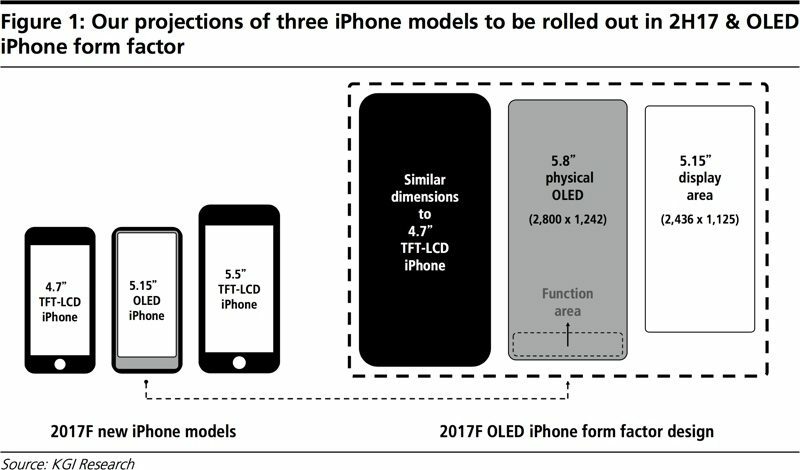 Size wise, Kuo says the OLED iPhone will have measurements similar to the 4.7-inch iPhone, allowing for one-handed operation. I don't know about you guys, but I have fairly large hands and I don't feel the current 4.7" phone is a comfortable one-handed experience, especially not with the butter smooth, rounded edges. Bring back the sharp, squareness of the iPhone 4! Am I the only one who is really freaked out by this facial recognition rumour? So, all anyone has to do to unlock my iPhone is point it in my face? Or worse a photo of me? Not to go to much down this law road but for instance you get arrested and they want to search your iPhone - they just hold it in front of your face and it unlocks? THAT is scary!! Give me finger or iris backed up by passcode any day. There must be some sort of work around to this, like finger scan AND face on camera? I dunno.. This sounds weird to me..
Can't wait for the part leaks! If history is any indication, then next month we should be seeing some (like the iPhone 6 in March 2014). Am I the only one who is really freaked out by this facial recognition rumour? So, all anyone has to do to unlock my iPhone is point it in my face? Or worse a photo of me? Cool your jets. You don't even know how the tech will work. Existing facial ID technology utilizes a depth map, so using a photo is impossible. Security is always at the forefront of Apple's concerns, and they're not dumb. So I wouldn't freak out until I saw the actual product. home button better be tactile (and not just vibrations). or else this is going to be a big design fail. This far out, Kuo's predictions aren't that good. A few months prior I'll start listening to his predictions. Last year he kept harping on three iPhone models with one having a dual-camera and one being plus sized with a single camera. Didn't make sense, and it didn't come to be. If the prices keep rising the bubble is going to burst. At some point people are going to fall out of love with getting the latest phone every 12-24 months and realise the one they have does everything well enough for 5 years. These things are going to become like the iPad or your desktop PC soon and raising the prices will only hasten that future. I like it. Presumably, apps would still be able to go full screen and hide any buttons, just like they do now with the top bar, etc. Cannot wait for this. I've been waiting for a near bezel-less iPhone for ages. And I like how it'll be, roughly, the same size as the 4.7-inch. Let it be true Apple! !